Three times Tour de France winner Alberto Contador will be free to defend his title at the race this July after his hearing before the Court of Arbitration for Sport (CAS) was postponed until August. Spaniard Contador who won last year’s Tour de France ahead of Luxembourg rider Andy Schleck, tested positive for the banned substance Clenbuterol but he was cleared of any wrong doing by the Spanish Cycling Federation after Contador claimed the substance had entered his system through a piece of contaminated beef. However, the World Anti-Doping Agency (WADA) and the International Cycling Union (UCI) both appealed the decision and the case was to brought in front of the CAS on the 6-8 June of this year. The new dates set for the 1-3 August will now mean Contador will be free to take part in the Tour de France which begins on the 2nd July and concludes a week before the hearing’s revised date on the 24th July. Contador, who claimed his second Giro d’Italia title last week has dominated the sport for the past four years, becoming only the fifth man in its history to win all three grand tours, the third being the Vuelta a España and he is thought to be aiming to become the first man to win the Giro and the Tour de France in the same year since Marco Pantani in 1998. Obviously the correct outcome needs to be ascertained but like most fans and members of the cycling community; to have the case hanging over the Tour de France as well as the Giro d’Italia will provide an unwelcome distraction from the race. Contador himself has always expressed his innocence and has maintained his focus and level of performance, handling himself very well when coming up against opposition in the shape of fans who want to see him banned. Although he experienced the occasional bit of booing and insulting signs from fans at the side of the road in the Giro, Contador showed his supreme skill as both a climber and a time trialist as he walked away with the Pink Jersey, finishing a huge 6 minutes and 10 seconds ahead of next placed man Michele Scarponi. 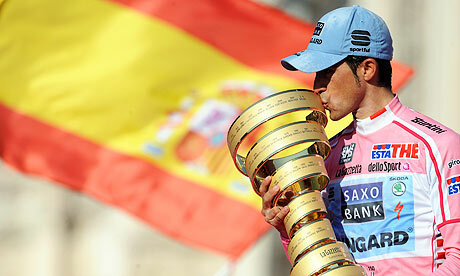 As well as the overall title, Contador won the Points Classification as he dominated the field. For now, the hearing will once again have to be placed on the back burner as the Tour de France takes centre stage and Contador is just one of a number of riders hoping to be wearing the yellow jersey come July 24th and the Champs-Elysees. The question is will Contador even be lining up for his Saxo Bank-SunGard team at the Tour. After his Giro success Contador was rather non-committal about his plans for July “The Tour? We shall have to see . . . how I am going to recuperate, evaluate the extent to which I have recuperated. I have to speak about it with my sporting director and my team.” Personally I want to see Contador at the Tour as whatever you think of him he is still at the top of the sport and until an official decision is reached by the CAS he should be free to ride where and when he wants. However, if Contador was to be found guilty at the end of this doping saga he could face a two year ban as well as being stripped of his 2010 Tour de France crown and the 2011 Giro d’Italia titles. For now though, lets all look forward to the start of the biggest race of the year next month.